After a brief pause, the world’s Central Banks (or at least those in Asia) have begun to once again accumulate foreign exchange reserves. I’m not one for hyperbole, but the figures are downright eye-popping: “Reserves held by 11 key Asian central banks totaled $2.625 trillion at the end of August, up from $2.569 trillion at the end of July, according to calculations by Dow Jones Newswires.” Most incredible is that this total doesn’t even include China. whose reserves could exceed $2.3 Trillion by now. “Taiwan and Thailand, the most aggressive in defending the U.S. currency, have logged record-high reserves every month since December.” Japan, whose reserves are the second highest in the world (after China), is the lone holdout. As the Forex Blog reported yesterday, the newly elected Democratic Party of Japan will pursue an economic policy that depends less on exports, and has pledged to stay out of the forex markets. While China’s economy is no exception, its nascent recovery is being driven by capital investment, government spending, and (ultimately?) consumer spending. 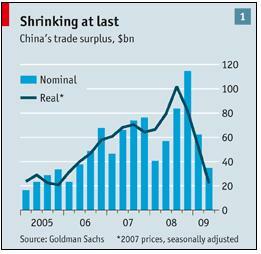 As a result, it is forecast that “China’s current-account surplus will fall to under 6% of GDP this year and 4% in 2010, down from a peak of 11% in 2007. Exports amounted to 35% of GDP in 2007; this year…that ratio will drop to 24.5%.” If such an outcome obtains, it will almost certainly lead to a slower accumulation of reserves. While this is all well and good, the more important question for most (forex) analysts is how these reserves are being held. 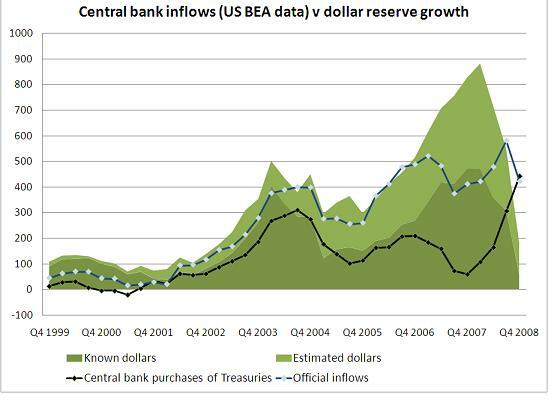 The vast majority of these reserves are still denominated in US Dollar assets, and in fact, the proportion may have risen slightly since the beginning of the credit crisis. Asian Central Banks are particularly biased towards the Dollar, which accounts for 70% of their reserves, compared to the worldwide Central Bank average of 64%. This last quote inadvertently confirms that the role of the Dollar as the world’s reserve currency is being treated as a political issue, when in fact it is a financial economic issue. In other words, while many countries want to limit the influence of the US by limiting the power of the Dollar, their Central Banks are stuck with it because it remains the most practical, and advantageous option. Dumping it would be akin to punishing themselves. Very interesting article. It will be interesting to see how Japan’s decisions affect the Forex markets. Hopefully, you will follow up later on and let us know what affects Japan has on the market. I think if we would end the war our dollar would go back up. We have too much money invested in this endless and pointless war. I am a soldier in the US army and have been here two times it seems pointless to me. So why waste the money and not use the US dollar for better things. Have Questions? Want to Share Your Review? Be heard. Please share your reviews today! © 2004 - 2019 Forex Blog.org. Currency charts © their sources. While we aim to analyze and try to forceast the forex markets, none of what we publish should be taken as personalized investment advice. Forex exchange rates depend on many factors like monetary policy, currency inflation, and geo-political risks that may not be forseen. Forex trading & investing involves a significant risk of loss.